I've joined a Blogger Babe group and with their inspiration, I've set a new challenge for myself: to blog every day! I'm not sure, how long I'll be able to keep it up, but I'm going to give it a try. So, for today, in the spirit of The Sartorialist (one my favorite blogs), here's some fabulous Street Style I saw in New York City on Saturday. I loved her daring mix of colors and mash-up of casual with dressy. Having a tough time with the colors but like the casual mix of pieces! Good luck blogging everyday. Oh, Jennifer--Merci beaucoup! I do think blogging everyday will be challenging, but I'm going to try. 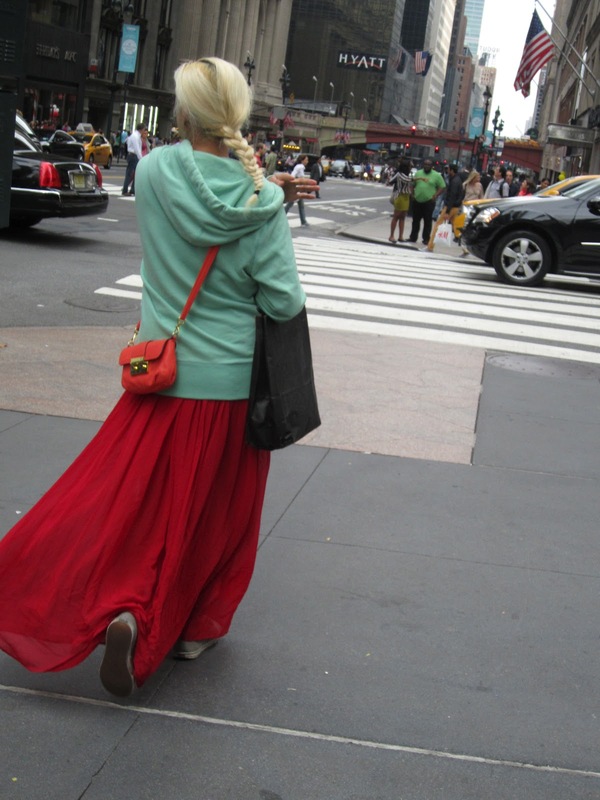 And yes, I agree about the colors, but seeing her on the street (42nd and Lex), I thought--it's kooky, but it works. She was a very artsy girl and reminded me a little of my daughter. Enjoy Columbus Day!